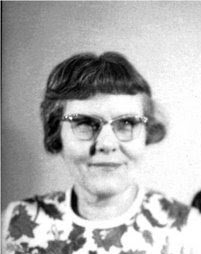 Edna Walker Chandler, born near Macksville, Kansas, in 1908, grew up with the rhythm of the wheat. Victory over the natural enemies of wheat was a personal victory for her family. Defeat of the wheat meant hardship for all. Mrs. Chandler received her first two years of college education at Friends University, Wichita, Kansas. She graduated from Sacramento State College in California. 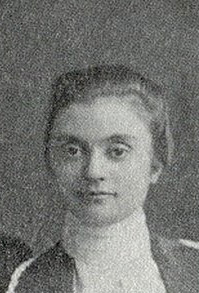 She and her husband spent several years in education work for the United States Indian Service. Later they were both involved in the AID program in Liberia, West Africa. 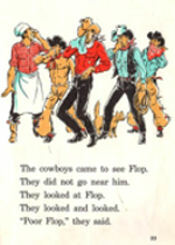 Mrs. Chandler is best known for her children’s books, among them the popular COWBOY SAM series. She has also seen the publication of WOMEN IN PRISON, a non-fiction book, plus many magazine articles and stories. CHAFF IN THE WIND is her only adult novel. Chandler graduated from college in 1958, at the age of 50. Her family raised, she became an author, writing a series of books for slow readers, the COWBOY SAM series. Her children’s books can still be found on school districts’ recommended reading lists for young learners. She died at the age of 74, in 1982. Chaff in the Wind, Chandler’s only adult novel, was first printed in 1964 by Sierra Printing and Publishing Company, Sacramento, California. A sample of her writing from this book is below. Again it was April, and the Spring of 1887. The Kansas winter had been quiet, and only two raging blizzards had stormed across the west. For that, Ingrid Halgren was glad. She had been afraid of that piercing, demanding cold, the sifting snow that would not be kept out. It came through the cracks of doors and windows. It whipped and swirled in deep, enclosing drifts—drifts that were formed by the force of relentless, powerful icy blasts that would not be stilled until their fury was spent. Ingrid had not yet learned that the blizzards were the salvation of the dry lands, that fewer snows meant dry, packed soil under the top soil; that few snows usually meant a short rainy season. This spring the rainy season lasted only a week, bringing two fitful apologetic days of rain and three or four days of threatening fot and mist. The bright sunlight after the rain was welcome and warm, but it came too soon. The wheat in llate May was knee high, promising and thick. Ingrid and John walked through their field one Sunday afternoon, loving the swish of the wheat with their steps, still hopeful that the heavens would open in mercy and save their wheat. CHAFF IN THE WIND, a family story of the Kansas wheat land, covers the whole spectrum of human emotions; it portrays life as it was near the close of the nineteenth century and beginning the twentieth. The book is historically accurate, making it a valuable resource for Americana units in the school curriculum. Although told simply enough for junior high readers, it is also exciting fare for adult lovers of adventure novels. CHAFF IN THE WIND, a story of Swedish emigrants in Kansas, is a moving account of courage, struggle, despair, rejection and love--love for each other, for the land and for the wheat. It will be a most welcome addition to the pioneer genre. EDNA WALKER CHANDLER'S historical perspective is excellent and the family is placed in proper context when outside events affect life in southwestern Kansas. The Halgrens come through as real people, and the realism comes across to the reader in a penetrating but never unpleasant way. This is a good book which should appeal to any Westerner interested in how this region developed.